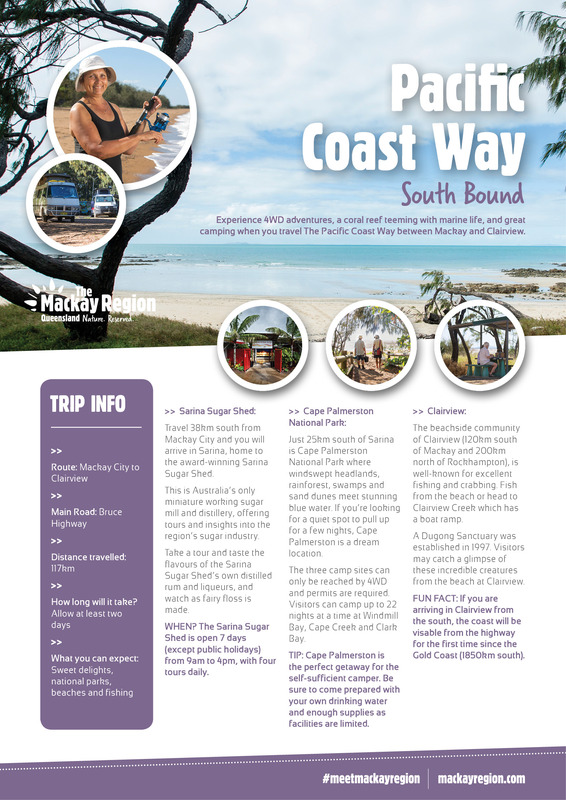 Experience four wheel drive adventures, a coral reef teeming with marine life, beautiful beaches and great camping when you travel the Pacific Coast Way between Mackay and Clairview. This stretch of coast is largely untouched. Rugged and raw, this section of natural coastline is home to patches of ancient rainforest, remote beaches and exciting marine life. Allow at least two days to explore this area, more if you intend to camp at the wild and remote Cape Palmerston. Mackay to Sarina: Drive 38 kilometres south from Mackay to Sarina, home of the award-winning Sarina Sugar Shed. This is Australia's only miniature working sugar mill and distillery, offering tours, tastes and insights into the sugar industry. Taste the distillery's own rum and watch candy floss being made. You can find the Sarina Tourist Art and Craft Centre near the Sugar Shed at the Field of Dreams complex. Nearby Sarina and Grasstree Beaches provide lovely coastal locations to enjoy a beachside picnic. Cape Palmerston National Park: An off-road paradise 25 kilometres South of Sarina providing a serene place for self-sufficient camping. Open eucalypt woodland grows on the ridges; while mangrove swamps, rainforest and sand dunes are all part of the cape’s rugged attraction. Traverse the oceanside cape to view abundant marine life below, including turtles, dugongs or humpback whales from June to September as they migrate north. Self-sufficient campers can bush camp at Windmill Bay, Clark Bay or Cape Creek. The camp sites can only be reached by four wheel drive and permits are required. The undeveloped wilderness surrounding Cape Palmerston’s camping areas provides access to excellent fishing locations and rugged bush walks. TIP: Bring your own drinking water. Delightful beachside communities, popular for fishing and crabbing, line the coast from Cape Palmerston to St Lawrence. Catch a crab in Carmila: Camp near the ocean and reel in the ocean’s bounty by trawling nearby creek mouths. Facilities include toilets, barbecues and picnic tables. A boat ramp is located at Carmila Creek with a playground and beach access nearby. Flaggy Rock: Accessible by four wheel drives, it provides beautiful 360 degree views toward the ranges and across the Coral Sea. Stop at a local café and gift shop to indulge in home baking, sample some of the freshly-made fruit ice cream or purchase a precious gem to take home. Dugongs in Clairview: 120 kilometres South of Mackay, the beachside community of Clairview is known for excellent fishing and crabbing. A dugong sanctuary was established in 1997. Visitors may catch a glimpse of these incredible creatures from the beach. Fun Fact If you are travelling from the south, Clairview is the first place you catch a glimpse of the sea from the highway since the Gold Coast, 1,850 kilometres south. St Lawrence: One of the most historic towns on the Queensland Coast, worth a visit to view historical buildings and relics.